It's quite hard to count the squiggles, so the wave i labeling at Friday's low is just assuming that we get the usual Monday ramp. Now and two years ago the first decline (f1) was followed by a huge (bailout) rally (f2) which did not exceed the previous high. Surprisingly (NOT), the problem wasn't solved with all that money so the sell off resumed and made a new low (f3) just a few days later. A last desperate attempt (f4) of the bulls to prevent the crash failed and so we plunged hundreds of points within just a few days. 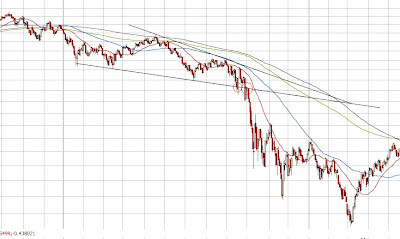 In 08 the support line connecting the lows of the previous first waves was first breached late September. The market immediately bounced but breached it again a few days later. A backtest followed and then we crashed. 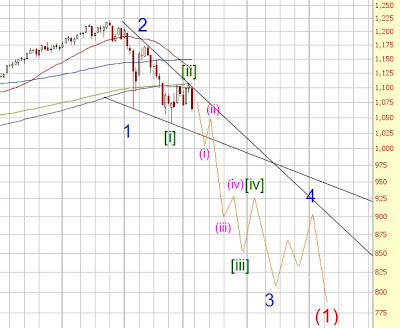 I also added the trendline connecting both second waves. It looks now like a Leading Diagonal, doesn't it? Huh? Right! The same LD and I bet that many will be counting it as an LD if we sell off to 1020 or even a bit lower to 1000 and then get a strong rally. If we then get another, unexpected for many, sell off below 1020 and backtest it a crash is very likely. I'm not a fan of crash predictions but being careful these days could be the right thing to do. Assuming that Primary [C] has started Intermediate (1) should bottom near the 09 lows. Possible target for Primary [C] at 300 ([A]=[C]) and at 500 ([A]=[C] (in %)).